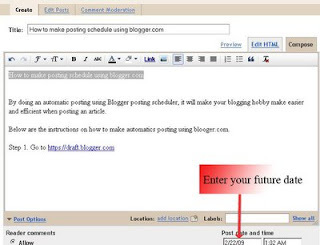 Automatic posting using Blogger posting scheduler will make your blogging hobby make easier and efficient when posting an article. 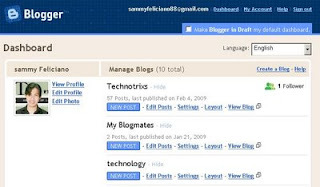 Blogger in draft is more enhance with its new features, functionality, and interfaces compare with normal blogger editor. 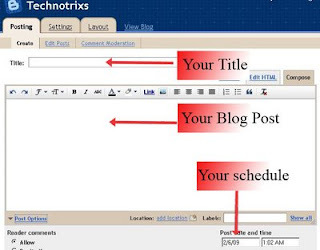 This techniques is definitely useful to you, for example; if you are away with your home, nothing to worry about using blog scheduling method your reserve blog post or article will automatically posted on the target date you've set. Below are the instructions on how to make an automatic posting using blooger.com scheduling method. "You will notice the “B” logo will now becomes blue." Step2. After that Click New Post on whatever Blog you are going to post your article. Step 3. Then after that, you may now type anything you want inside the compose box. and then don't forget to enter the future date, then your blog post will automatically been posted when it reach you target date. Step 4. Now your done, your blog post is now on Scheduled list. If you find this tip was helpful to you, just simple leave a reply.